High cube containers differ from standard containers in height by one foot bringing their external height to 9ft 6 inches. They are clearly identified by the yellow and black height logos on the top rails. 20ft and 40ft high cube containers are sold in new or used condition. New containers or one way shippers as they are also known are generally built in China, shipped to the U.K with a cargo then emptied and returned to depot for sale. These one trip containers are sometimes built up to 2 years before they are sold however they will have only ever been used once to get them delivered from factory and will be in brand new condition. 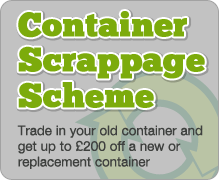 Used containers are sold in 3 grades – A, B and C. The different grades will vary in price, age and condition. The newest container may not always be the best as you may find older containers that have had an easier life and used less than one much younger. It is possible to have a used high cube container in any length converted from a standard size container giving customers options from 3ft-45ft in length. Both new and used 40ft high cube containers come in a variety of colours and are available in wind and watertight condition or fully inspected, CSC plated and certified for shipping. Lockboxes for added security are an optional extra.